Eyesight is just one of the issues which can direct a person towards an optometrist. It is the most common, granted, but there are plenty of other conditions or diseases which can cause discomfort and drastically reduce the quality of one’s life. Blepharitis is one of them. Although it can be easily detected through an eye exam and its symptoms can be alleviated, it’s best you know at least something about the disease. First of all, what is blepharitis? The most straightforward explication is that the condition refers to the inflammation of the eyelids, causing a person’s eyes to feel sore and gritty. Sadly, it’s a recurring condition with no definitive cure. The most important thing in treating it (at least at the level of limiting its symptoms) is daily lid hygiene. 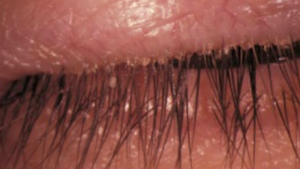 In practice, we can differentiate between 3 types of blepharitis: staphylococcal (caused by a germ), seborrheic (associated with dermatitis) and Meibomian (caused by the dysfunction of a gland). These are the most common symptoms, most of which affect the comfort of the patient’s life. Thus, a visit to the optometrist for an eye exam is the next logical step, where several treatments can be prescribed to both alleviate symptoms and prevent their resurgence. When left untreated, blepharitis can have several complications, which can all be avoided through regular eye exams and proper eyelid hygiene. o Warmth – softening of the skin by pressing it gently with a facecloth, which has been previously soaked in hot water. The process should take 5-10 minutes. o Massage – Directly after the softening, massage the eyelids, by sweeping downwards when rubbing the upper eyelid and upwards for the bottom one. Repeat the process 5-10 times withing 30 seconds of warming. o Cleaning – Clean the eyelids, using either cotton wool buds dipping in baby shampoo, special eyelid scrubs, or just washing them with cool water. – Artificial teardrops. Because blepharitis is often associated with dry eyes, your optometrist might suggest using artificial tear drops as a cure for both. – Antibiotic treatments. If discomfort leads to an infected eyelid, antibiotic treatment becomes necessary. That being said, it’s clear that a regular eye exam could help a lot with treating the symptoms of blepharitis. There is no reason to live with a permanent itching and swelling of your eyelids when a simple visit to the optometrist and a rather non-invasive treatment could improve your life. If you noticed any of the symptoms described above, we recommend scheduling an appointment with your optometrist as soon as possible.